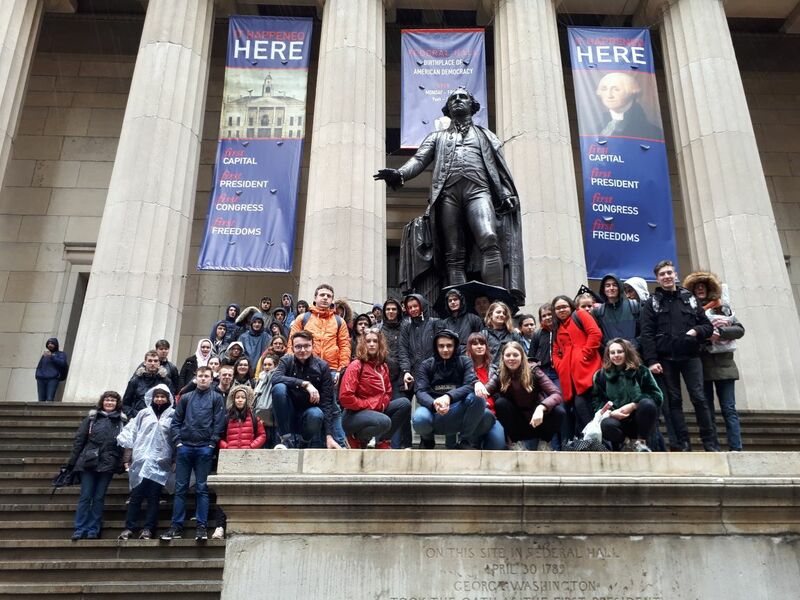 Du 17 au 23 avril 2018, 70 élèves de Terminale ont séjourné à New York. Ici, sur cette page, le compte-rendu rédigé par les élèves eux-mêmes, accompagné de photos ! Tout le monde est bien arrivé. Un vol Air France très agréable ; le groupe est arrivé à l’auberge à 21h30. We met at CDG Airport to check in on our flight towards New York. We got through the security, got every piece of metal in a box in order to pass the security, and finally we got on the plane : the flight lasted eight hours approximately. When we landed in JFK, we had to wait half an hour because of the air traffic in the Airport. Today’s weather isn’t great, we’re looking at some gray clouds and a freezing cold i.e 7°C, which is the opposite to when we left Paris. Anyway everything went fine and we’re all looking forward to a great week. 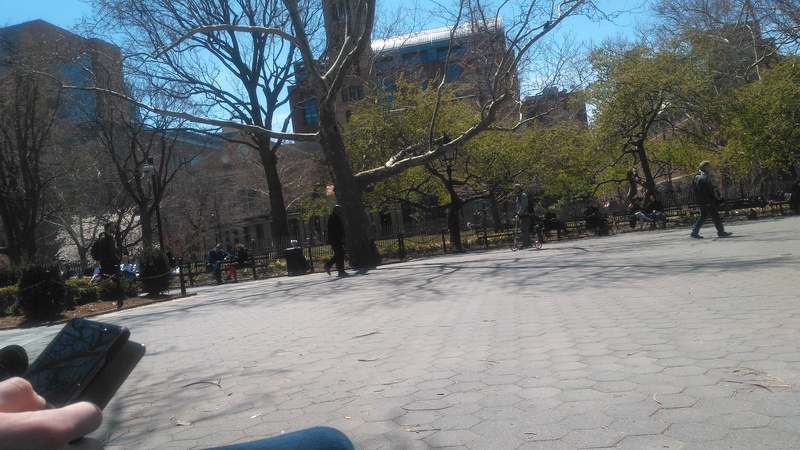 On April 18, 2018, in the morning after having a hearty breakfast we went to Central Park where we saw some squirrels, so cute ! 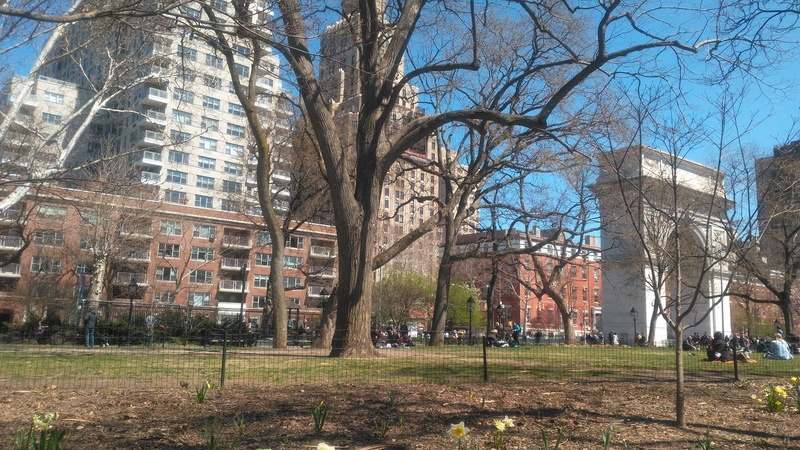 We ate our picnics in Central Park on top of rocks and then went for a walk around the park to the John Lennon Memorial. In the afternoon we took the dirty underground (with rats) to go to the Empire State Building. It was really high as we peaked the 86th floor, it was beautiful and amazing! Then we had 2 hours of free time in New York, we went shopping. After that we took the subway to go to the Apollo Theater. We saw amateur artists perform on stage, people of all ages. The presenter made us laugh and the show was very good but we were all tired. To get back to the hostel, we had to walk because we missed the last metro … we went to eat at the pizzeria a very hearty meal (breaded turkey escalope covered with tomato sauce and cheese with a few leaves of lettuce and for dessert we had small donuts). Just a short summary of Day 3 in Manhattan, New York. We’ve started the day with the Statue of Liberty. It was great to see such a remarkable monument which symbolizes America and its strong values. 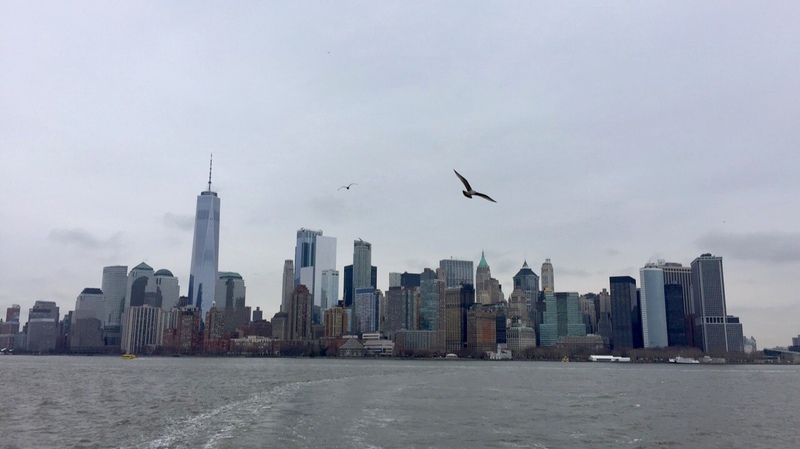 Then we took a second time the ferry to reach Ellis Island, the migrants’ key place during the early 19th century and first half of 20th century. 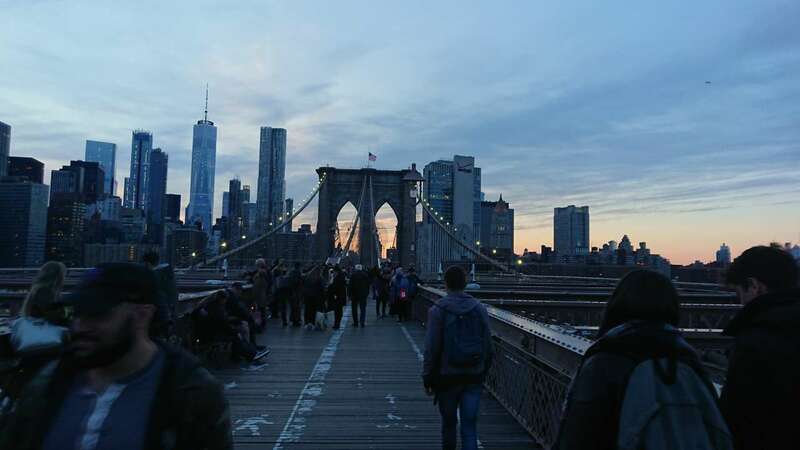 After this, we walked into Wall Street, the economic heart of America and even of the world. It was really impressive and breathtaking as we felt really small between all these skyscrapers. Then we kept on our way to Ground Zero, the place of the terrible terrorist attacks on 9/11. 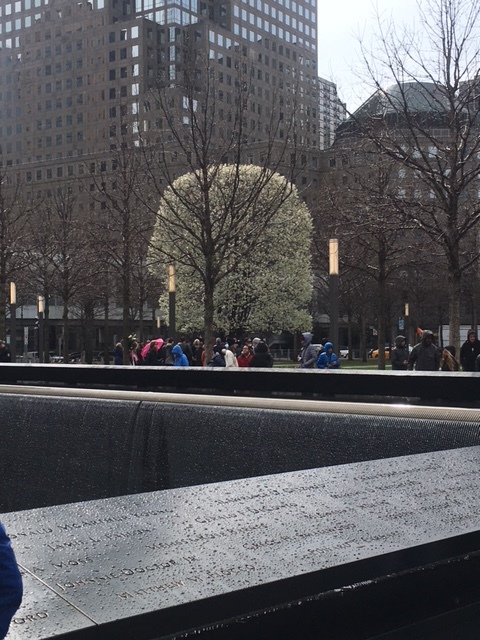 We were touched by the memorial and the intensity it conveyed. 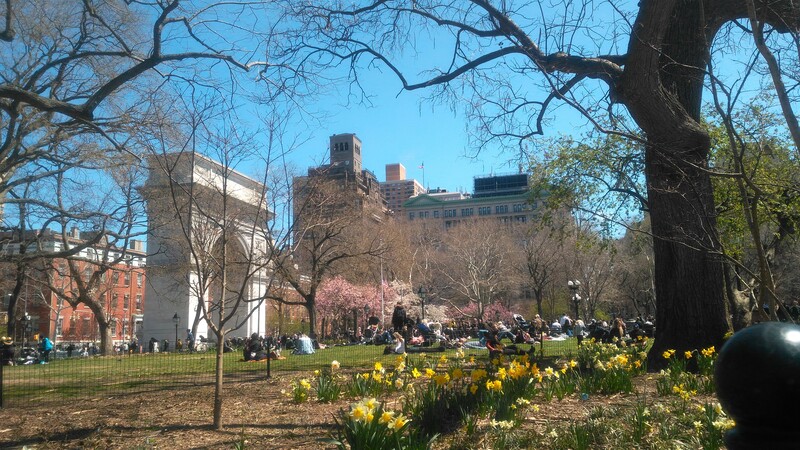 We finished our day with free time around the area of Downtown Manhattan. Moreover, some students had a free guided tour with the cultivated Mr Gachon. That is all about this day. Despite the cloudy weather we enjoyed it and had fun. We gathered at 9 this Friday morning. After that, we took the subway in order to go to the United Nations. The place was impressive, due to the huge secretary tower and the different gifts that were given by country members of the organisation. We learned quite a lot of information thanks to a guided tour (in French for some of us and in English for the others) in the UN rooms. Aftewards, we had lunch in a park near New York City Public Library, which we could visit during our free time of about an hour. As we were too early for the Rockfeller Center, we stopped at Saint Patrick’s. Then, we were « at the Top of the Rock », which allowed us to have an astonishing view of NYC. On our way to Times Square, we discovered the Trump Tower. 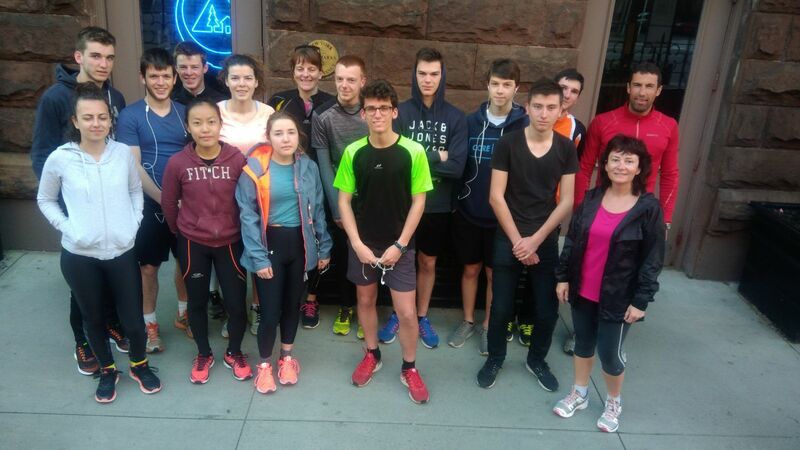 This last day of our stay in New-York began (for a few volunteers )at 6:30 a.m with a runn in Central Park. 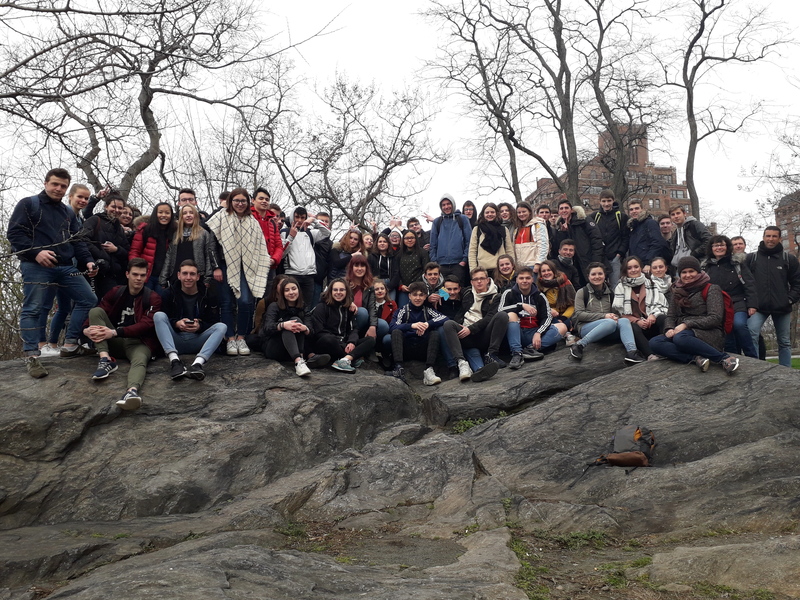 Although we’d already visited this green area, this sporty activity enabled us to have an another insight of the emblematic place of Manhattan and also to burn a few calories (that we could have taken because of the inordinate American food) at the same time. That was definitely a great and enjoyable experience to run between the newly-blossomed cherry trees and the adorable squirrels. Right after a last American breakfast that made us regain our strength, we went on a last visit, taking the subway once again so as to go to the MET, a Museum of Art, located near another side of Central Park, where we walked a while, enjoying the fine weather we had been waiting for the last few days. Afterwards, we finally went to the museum composed of an incredible number of rooms exhibiting masterpieces of all eras and places in the world : American art, Egyptian art, Modern art, European paintings… According to the significance of the exhibitions and the time we had, we were constrained to choose only 2 or 3 topics, that was quite frustrating. However most of us weren’t disappointed by this museum showing an incredible diversity of ancient objects and works of art : Egyptian sarcophaguses, age-old Asian prints, contemporary paintings… What makes this museum so unique is its monumental aspects that gave us the impression to discover in real life all these cultures at different times. Finally, after having spent between 2 and 3 hours in the museum that passed quite fast, we had to go back to the youth hostel where we got ready for the departure. Despite the run and the tiring week, we walked on foot one last time before leaving the big Apple.